WD40 is one of those items that almost everyone in their house has, but barely ever uses it. It’s widely known as a lubricant, with its full name actually being “Water Displacement, 40th Formula”. However, being a lubricant isn’t all that WD40 does very well. There are endless uses for WD40 that make life easier. 1. Helps Stop The Growth Of Mildew - simply spray any wooden furniture in spots you want to protect from mildew and the WD40 will form a proactive layer against it. 2. Getting Labels And Stickers Off - If you’re like most people, anytime you buy something from a store with a sticker or label it never comes off clean. You’re left with half a sticker that seems to be stuck on for good. Just spray on WD40, give it a few seconds to dissolve the glue. Now you can wipe it off completely without any effort. 3. Erasing Marks For Hard Surfaces - Kids love to take crayons and go wild everywhere but the piece of paper you gave them to draw on. Next time your kids draw on one, try cleaning it off with WD40, it should be easier than ever. Just make sure you remove all the WD40 from whatever surface you clean because it will be very slippery. 4. Make Digging With A Shovel Easier - Since WD40 is a lubricant, people say it makes using a shovel so much easier. It’s like taking a knife through hot butter. Spray some on before your next day of yard work and be amazed at how effortless it makes digging. 5. Remove Chewing Gum From Shoes - We’ve all been there, you step on something while out and about only to find out its gum. It’s gross and you can never get it all off. Cover it in WD40, then wait a few minutes. It will come right off, leaving no gum stuck on. 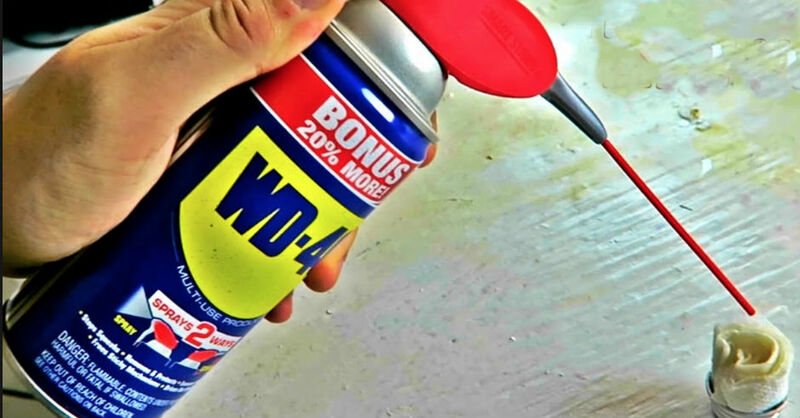 These are our favorite uses for WD40 but there are countless other ones. Next time you’re thinking about throwing away a can of WD40 because you think it has no use, save it. It will be sure to come in handy when you least expect it.